Nationwide Insurance, the Exclusive Insurance Provider of the Cincinnati Bengals, is leveraging its team partnership with an innovative promotion designed to engage the Bengals fanbase. 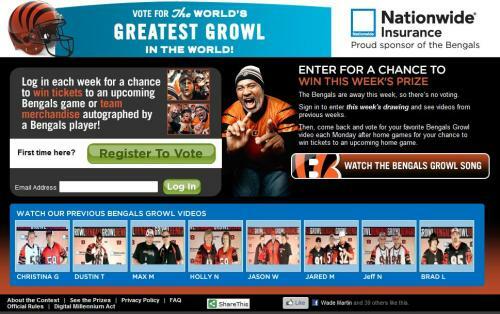 The initiative, entitled the "World's Greatest Growl in the World", allows fans to perform a :30 karaoke version of the Bengals touchdown song for the chance to be featured on the Bengals website and an ultimate Grand Prize of $25,000. Each week, fans who submit videos can win co-branded items, tickets, and autographed merchandise for participating and the ten (10) best entries will be featured on Bengals.com/Nationwide. Fans can then log in and vote daily for their favorite performance among the entries submitted (thus, both performers and voters become active leads for Nationwide). Fans who submit their favorite clips even have the ability to share them with family and friends via email. Nationwide's "The World's Greatest Growl in the World" promotion has been extremely well received by Bengals fans thus far. Fans loved performing :30 karaoke versions at the Bengals home opener and traffic to the website has been very active in the early weeks of the promotion. Nationwide will also be leveraging its partnership with the Bengals by offering free ferry rides to Bengals games for all fans on a co-branded ferry (another great idea!). The Bengals feature a collection of fan videos on Bengals.com/Nationwide. There are some classic performances that are worth checking out!